"As Nero’s persecution of Christians increased, many of them were made to wear animal skins and were then torn to pieces by dogs. Some were smothered in oil and set on fire to serve as light for his garden parties. 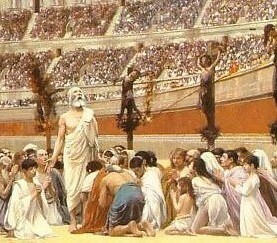 Others were nailed to crosses and many of them were simply done to death to please the emperor. ..."